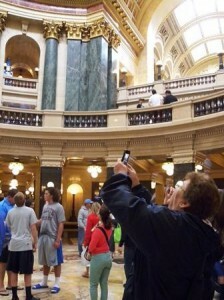 Linda Burton posting from Madison, Wisconsin – My favorite thing about the Wisconsin State Capitol is its “town squareness.” You know, like the courthouse square in most of small-town America; the village green; the gathering place. Make no mistake; the building is massive, and elegant; and still serves all three branches of state government. The governor’s office is on the first floor; visitors are welcome in the adjoining conference room, a Venetian palace look-alike with fancy-dancy paintings on every wall; the ceiling too, look up, for sure. 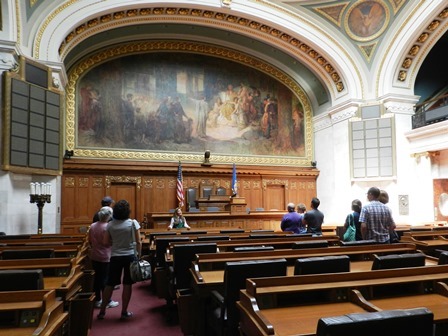 The Senate and the Assembly each have chambers on the second floor, as does the Supreme Court; the fourth wing is the North Hearing Room. 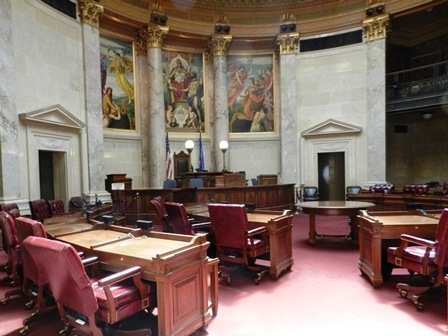 Everything has a glamorous look; there are marbles and woods from Germany, and Italy, and France; and, to stay true to its roots, Wisconsin, of course. But it shares its elegance; it’s an open-door capitol. Every entrance is available, on every side; walk in and look around, or take a tour, or express your opinion, seven days a week. Visit on a Saturday, when the Farmers Market tents surround the square. People come in to be dazzled; posing for pictures on the balcony as they wave at their photographer down below; arms filled with parcels of cheese, or farm-fresh kohlrabi, from the stands outside. The setting is magnificent; where else could you find a background like that? Where else such history, or such art? Where else such a forum for being heard? I had a conversation with the Capitol Police, whose desk fronts the Governor’s Office. And I had a conversation with one of the Solidarity Singers, who has been arrested by the Capitol Police at least five times during the last few weeks. They share a difficult problem; I listened to their conundrum. I visited the capitol several times; on a busy day and on a quieter one; I enjoyed people watching on the busy day; I focused on the building the second time around. I’ll tell you about the statue on top of the dome first; it’s hard to see from below so I didn’t get details until I picked up literature inside. Daniel Chester French did it; another gold-gilded bronze (remember Minnesota’s Quadriga?). 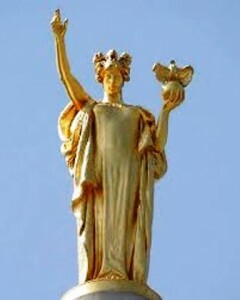 This statue is “Wisconsin” and represents the state motto “Forward;” the shiny robed figure has one arm lifted as in greeting; the other arm lifts a globe with an eagle atop. 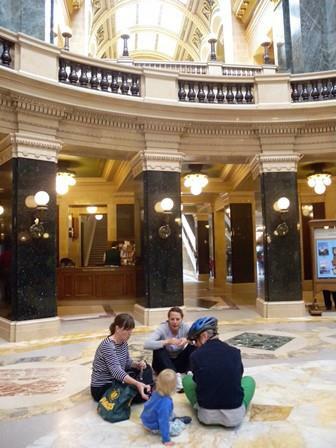 Her headgear may seem a bit strange; it’s a helmet with a badger on it; the badger is the Wisconsin state animal. She’s a husky gal, standing 15 feet 5 inches tall and weighing three tons. Walk on through, after a stop at the Visitors Desk to either sign up for a tour, or pick up orientation materials, or postcards, or books. 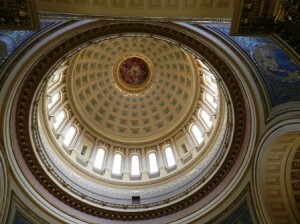 You’re on the Ground Floor; when you look up you see one of the largest domes (by volume) in the world; it’s the only granite dome in the United States. About 200 feet above your head is an Edwin Blashfield painting; I couldn’t make it out without the camera zoom; it is “Resources of Wisconsin” and is about 34 feet in diameter. The woman in the center holds a sheaf of wheat symbolizing Wisconsin’s agriculture; the other figures hold other Wisconsin products such as fruit, and fish. According to the literature, what looks like a frame around the picture is actually a balcony, but I can’t make that out. First floor, Governor’s Conference Room; there was a conference going on when I arrived; I waited a few minutes for the meeting to disperse and then was welcomed in; it was styled after the small council chambers of the Doge’s palace in Venice; elaborate and handsome; walls of cherry wood; floor of teak and mahogany; fireplace Italian Botticino marble, hand carved. 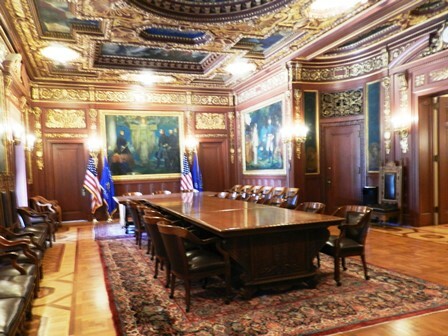 The long table in the center of the room is hand-carved French walnut; the state seal is carved into the headrests of the chairs. 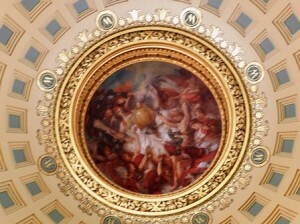 Hugo Ballin painted the 26 historical and allegorical paintings on the walls and ceiling; subjects range from the lakes surrounding the capitol to a portrait of Colonel Joseph Bailey, a Wisconsin lumberman whose knowledge of dam building saved a fleet of Union gunboats stranded on the Red River during the Civil War. 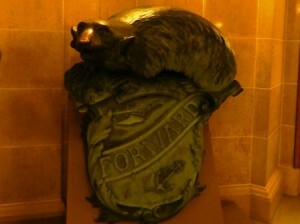 Also on the first floor, just outside the Conference Room, I came head to head with a badger (the state animal). It was designed in 1899 by artist Paul Kupper for the state of Wisconsin to present to the US Navy. Interesting story: the badger was cast with bronze salvaged from Spanish cannons captured in Cuba during the Spanish-American War and was mounted on the first USS Wisconsin battleship in 1901. The little fellow is hollow, but still weighs 1,200 pounds. Second Floor. Senate Chamber first; Wisconsin’s 33 senators meet in a red-carpeted room underneath a colorful skylight; it is decorated with French and Italian marble and a Kenyon Cox mural that depicts the opening of the Panama Canal, named appropriately, “The Marriage of the Atlantic and Pacific.” Voting is by roll call. 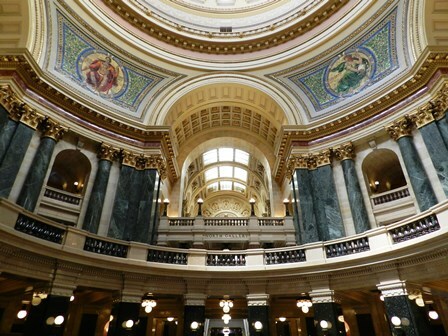 The Assembly Chamber next; the 99 assembly members also meet under a colorful skylight; electronic voting here, with Republicans traditionally sitting by the windows and Democrats by the doors. Another Blashfield mural in here; this one represents the past, present and future of Wisconsin; “Conservation” asks “Future” to preserve Wisconsin’s natural resources, while a badger looks on. The tour guide explained about the eagle, perched on a ledge above the speaker’s desk. “Old Abe” was a mascot during the Civil War to the 8th Infantry Regiment from Eau Claire, Wisconsin. 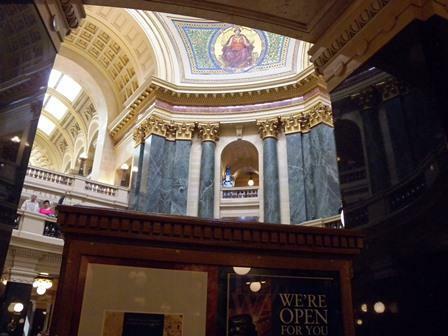 After the war, he returned to Wisconsin where he lived in the basement of the capitol until he died in 1881. His body was mounted and displayed in the (second) capitol, which burned in 1904. Old Abe was lost in that fire; the one displayed now is a replacement in his honor. 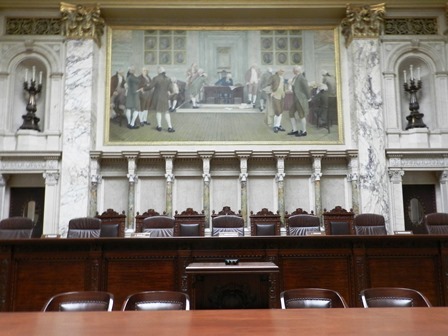 I peeped into the Supreme Court Room, a distinguished space; the Court meets here three or four times a month to hear arguments; it is open to the public. The painting at the front illustrates the signing of the Constitution in Philadelphia in 1787; George Washington is seated at the desk; Thomas Jefferson stands to his right. Interesting story: Jefferson did not sign the constitution nor did he help write it; perhaps the artist placed him in the painting because of his influence on American law. I peeped into the North Hearing Room too; it is used for public hearings; more murals, reflecting the history of transportation, from canoe to airplane. Back to the first floor for a last look around, and up. 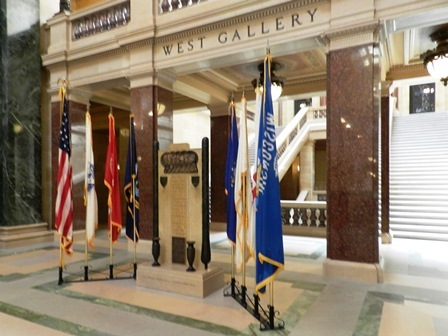 The flags on the west side of the rotunda include the Wisconsin state flag and the US flag, plus flags for the five branches of the military. A copy of Wisconsin’s constitution is on display on the north side; Wisconsin became a state May 29, 1848. 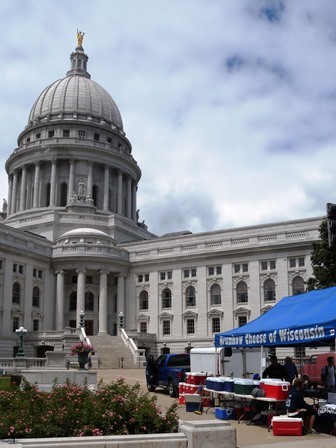 Why is Wisconsin the Badger State? Interesting story: in the lead mining towns of the 1830s, miners lived in shelters dug into the hillsides; they were called “badgers” after the burrowing animals. The most stunning sight from the rotunda, in my opinion (I kept taking pictures, from every angle), is that of the glass tile mosaics in the four arches up above; each mosaic contains about 100,000 pieces of glass tile and they represent the three branches of government – Justice, Legislation, and Government, plus Liberty. “Liberty” is shown guarding a ballot box. Outside, I sat down on a bench to look over the literature one last time. Oops, I almost forgot to mention the basics: this capitol was built between 1906 and 1917 and cost $7.25 million; architects were George P Post & Sons of New York. 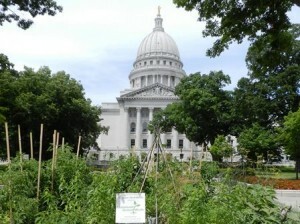 It is the third capitol; the first stood for 25 years (1838-1863); the second, larger one burned in 1904. Shade trees dotted the spacious grounds around me; across the street outdoor diners gathered for an early supper at The Old Fashioned; the Wisconsin Credit Union occupied one corner, the state museum another; a Walgreen’s in the middle, and a church. It was a short walk to my car, parked just past the tomato patch (maintained by Community Ground Works) in a meterless spot, right beside Madison’s town square.